Home / Columnists/ Need of the hour – if not the second! Need of the hour – if not the second! There is expectation in the air due to the Budget being unfolded. Following the footsteps of a mini budget and an economic statement, Budget 2016, to capture attention and receive eulogies, concepts and contents, will definitely have to be different. Just being different will not suffice given the current economic parameters it has to deal with and the social expectations it has to meet; the content really has to result from an imaginative juggling act. On 20 November we will witness the ‘reveal and tell’ episode of another State Budget. The adjectives describing the Budget will then follow soon after. It is certainly no easy task to satisfy everybody, particularly a populace who always wait for concessions, handouts and tax cuts. Even the rich expect fewer taxes to pay. We live in a society with poor savings ratio and an even poor investment ethos. Meeting expectations thus can really tax the system. There is though one grim fact that the direction set by this Budget can be critical for the economy as a whole. It is perhaps appropriate to list few quotes to emphasis the logic stated herein. Albert Einstein specifically stated that what is right is not always popular and what is popular is not always right. This is very important to understand in the present context where we at times and some definitely fall all over them to toe the line of popular at an enormous cost to the nation. This statement really should be digested well by all of us. How much time and effort have we spent on supporting or executing demands that stem from what is popular or to stay popular?! Don’t we all have some idea on this? As we battle the growing disparity in the society and the deepening chasm in trade balances, we forget some of the advantages of globalisation as well as the power of levelling possible with the emerging technologies. How many of us potentially deploy the power of the mobile and plan to do so across our work, life and play? Spending time online does not automatically translate into time well spent nor technology well applied. The technologies well utilised can enable countries with low gross domestic product figures to forge ahead in the economic sphere. A knowledgeable individual can potentially grow to unimaginable heights. Similarly if society is tuned to a knowledge state, the same could well take place within a society. Singapore had only the human resource to boast about. They did leverage on their human resources starting at an early stage and via the innovation eco-system that it developed through networking and strategic developments. This indicates that if one is to inculcate an innovation capability within a society, one can start counting adding to its wealth as the capability spins out results of value. Israel proved this by creating such innovation hotspots such as in Jerusalem and translating enterprises into wealth creators. It is truly sad to witness State-Owned Enterprises that really should be delivering real value to an economy being placed as wounded and sick, submerged in bureaucratic discussions, which really does not add any imaginative inputs to the current discourse on revival. It is indeed necessary to be honest and admit what one has achieved. We did have many reforms but we never had the Schumpeterian concept of creative destruction. That early learning in Germany perhaps changed them to continue to be a more manufacturing-driven economy than shifting to services. 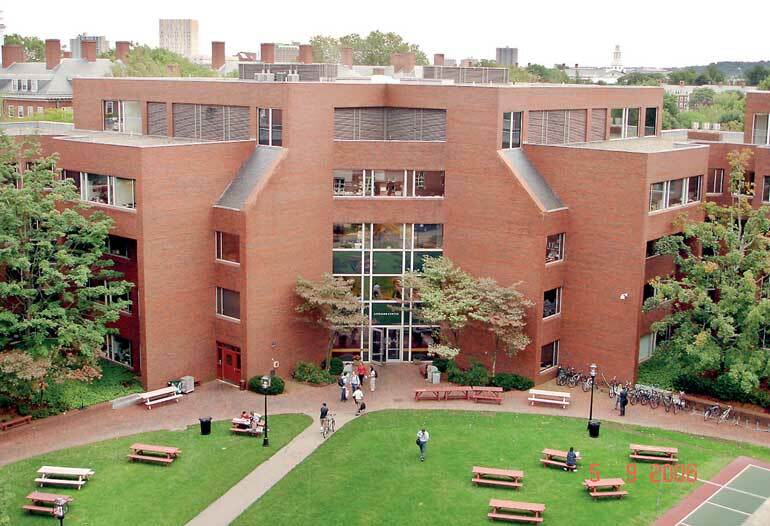 The Kennedy School of Government in the US has an annual task of identifying top 25 innovations in government. For better or worse someone should start doing this exercise for our system too. An honest result can do a world of good to the nation if not for the fanatic proponents of the current system. South Korea for all its successes still considers reforms are in order if one is to move onto a creative economy which is one of their current national agendas. Creative economy has been defined to be the process of making money by taking advantage of new ideas or advanced technologies which cannot be created overnight, but require years of accumulation of knowledge and technologies. This factor in periods of potential suffering too over the long years indicating nothing worthwhile is created without pain and sacrifice. This may sound an absurd objective from the terminology but become clear when the meaning is detailed out. A positive legal system means one which stipulates only what one can be done. A negative system on the other hand only stipulates what cannot be done. The connection to creativity becomes apparent under this explanation. A positive system positively frowns on novel ways as one is encouraged to do only the approved – one can view the ‘our way of doing things’ in this definition too as circulars, AR and FRs are explicit. Dr. Yoon compares interestingly a driver’s behaviour to drive home the point. In South Korea, a driver can make a U-turn only where it is specifically permitted (positive system). In the US, a U-turn is allowed anywhere not specifically prohibited (negative system), thus freeing the driver in decision making. The driver analogy may not be exactly applicable in Sri Lanka where a mad system exists but I think Yoon’s explanation is easily understood. It is about systems freeing people to take decisions unless the Government directs otherwise. He identifies this capability as important for a creative economy. While changing the administrative system will usher in better efficiency, investments too must follow. One area where we should have the courage to invest is in research and development. 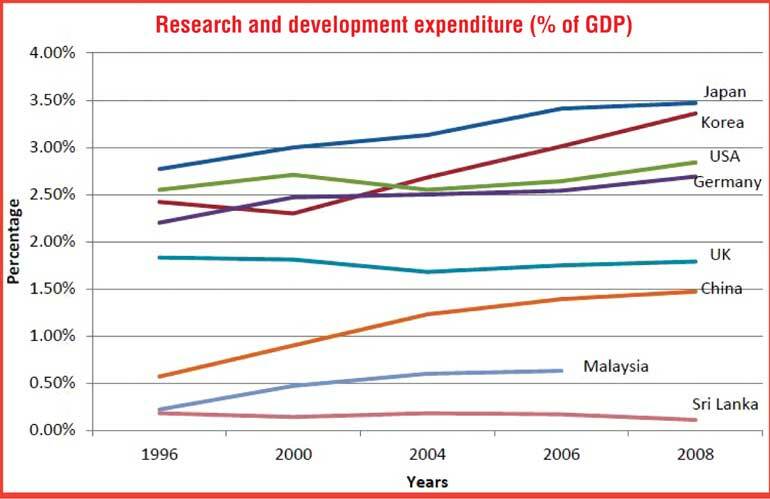 Sri Lanka stands exceptionally visible quite poorly when one plots R&D expenditure by countries over the years. When one views the R&D expenditure as a percentage of GDP, we have worked quite hard to maintain a consistent low value while one witnesses the rest of the pack increase their investments with time. Sri Lanka has also not published GERD (Gross Expenditure on Research and Development) since 2010, another practice that needs to be changed. No one with knowledge and sense can state that a country can do without R&D. If one waits till the economy to be ready first prior to starting investments on R&D such a strategy will not bear any fruit. It is said that in Cuba when Havana had no traffic on roads – it was stated that people can sit or stand in the middle of the road for quite some time without having to move about – they invested one billion dollars on biotechnology. The dividends from such an investment today are abundantly clear where Cuban biotechnology is world class. Again Korea, having the world’s largest R&D spending as a percentage 4.36% of GDP in 2012, is now contemplating another strategy for the next phase of growth. Our strategies in overcoming the middle income trap are much less clear. Fresh thinking is indeed the need of the hour. As we await an out-of-the-box Budget, it is indeed the feeling a chance is available for us to take a correction to the direction – a correction that is needed not because it is popular and even may not make one popular but simply because it is right and needed. When 21 November dawns on us, the rhetoric and the reality would both be known.